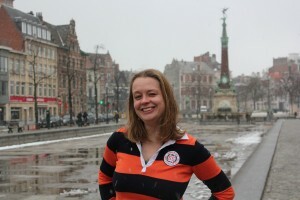 Carien is living in the city centre of Brussels since August 2011. Being new in town she did a lot of discovering to find the best spots in town for food, beer and fun. Brussels is a great city when you know where to be! She is still discovering more every day, but loves to share her knowledge. Are you planning to visit Brussels and you don’t feel like walking around with a map? Why not take Carien as your guide? You let her know what you want to do in Brussels, she’ll make a plan. I walk you around the city; take you and your travel mates where you want to go. If you have no idea what you want to see, I make a route based on the interests, available time and budget you email me. If entry fees are applicable, you pay for me. I show you the best places for Belgian beers, food to your liking, local events etc. Interesting conversations in English or Dutch about life, living in Brussels, travelling, writing, etc. A custom tour, just for you and your compagnons based on your preferences. Long touristy talks about the history of Brussels. To take you home or anything related to that. Info @ carientouwen. com. I am not available every day so try to inquire as much in advance as possible!